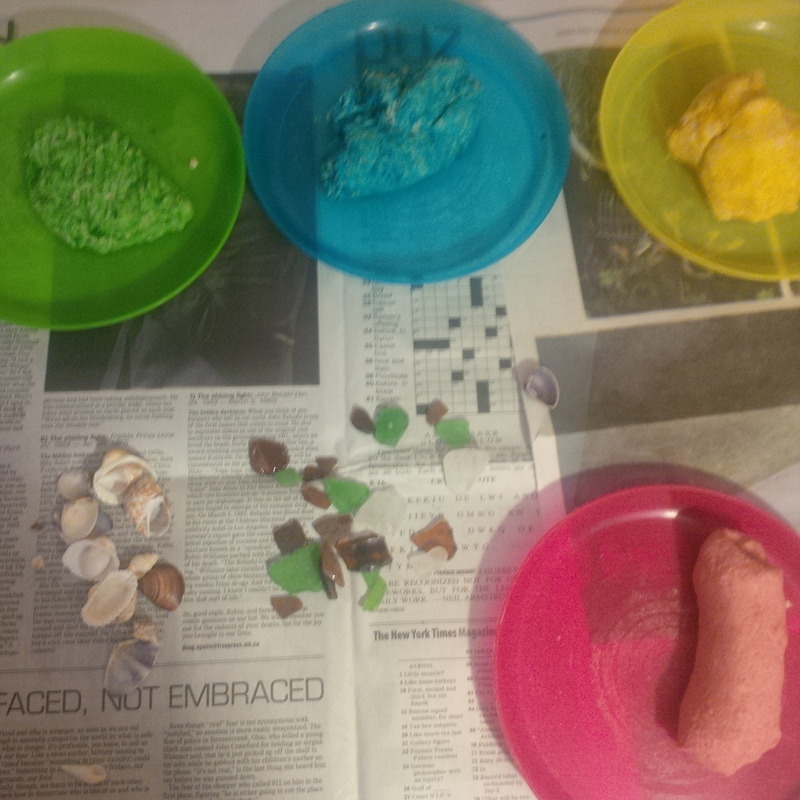 Salt Dough Creations – Great way for kids to display their summer treasures! The recipe itself is super simple – 2 parts flour, 1 part salt and 1 part water. Adjust accordingly – it stirs up easily so the kids can do that part. I always make sure to pick up cheap salt and flour at Dollarama for these types of crafts – we normally use whole wheat flour and it gives a different look and texture. I seperated the dough into 4 balls and coloured each one – just happened to have the exact matching coloured plates from Ikea so that made it pretty easy. The dough is salty of course – so make sure to put down some newspaper so it doesn’t stick or eat up the finish on a table. Get the kids to assemble all their treasures – seashells, sand or seaglass, all those special rocks they picked up along the way all summer. Almost anything is fair game – just remember that you’re low baking it at the end, so nothing that would melt easily. You could roll out the dough and get fancy with some cookie cutters – mine chose to freehand it and make all kinds of weird creatures. The rocks and seashells squished in nicely and are nice and secure after cooking. 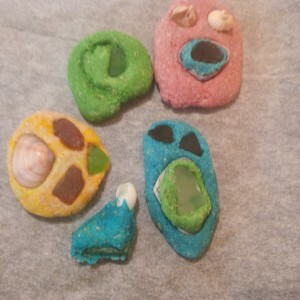 Great idea to put holes in them before you cook them to make pendants. Could also make xmas decorations too – great way to spread the memories from summer holidays. When the kids are done crafting, lay out all their creations on a piece of parchment paper (dollarama sells this too!) and bake it in a low oven – I left ours in for almost an hour, just flipped them halfway through and they were nice and dry. So many possibilities for this too – and such a cheap and easy way to do it. Best part, keeps kids busy and having fun – and cleans up some of the small summer clutter. Nice to be able to display it like this. What kind of summer stuff have your kids collected that would be perfect for this?